Have you ever experienced sticker shock? If you’re like some of the people following the development of GW Pharmaceuticals’ CBD-based drug, Epidiolex, then odds are you probably have. After gaining approval from the FDA, GW released the estimated price of its new drug at roughly $32,500 a year. But is Epidiolex really that expensive, how does it compare to other epilepsy drugs on the market, and what about hemp-based CBD extracts? Let’s take a look. To start, let’s talk cannabidiol (CBD). CBD is CBD, regardless of the source. CBD derived from hemp is in no way inferior to CBD derived from cannabis (or, legally speaking, marijuana). Hemp-based CBD has gained in popularity over the last several years because there are significantly fewer legal barriers for hemp CBD when compared to cannabis CBD. It is important to make this distinction because Epidiolex gets its CBD from cannabis, whereas most CBD extracts on the market are hemp-based. Doing a 1:1 comparison between Epidiolex and hemp-based extracts will be slightly difficult as Epidiolex is not yet on the market. GW Pharmaceuticals is currently waiting on the U.S. Drug Enforcement Administration to reschedule Epidiolex, which is expected to happen in September, before it can be sold in the U.S. Management has routinely said they expect the DEA will schedule Epidiolex as a Schedule IV or V drug. Once that happens, sales will begin in the United States. Similarly, the company is also waiting on approval from the European Medicines Agency to approve Epidiolex, expected to happen in early 2019. Hemp Business Journal estimates Epidiolex sales will be between 15-30 million dollars this year driven by a growing sales force and aggressive go-to-market campaign. European sales, which are expected to begin next year, could reach as high as $215 million by 2022. When it comes to estimating the cost of Epidiolex, all anyone has to go on is the previously quoted estimate released by the company. 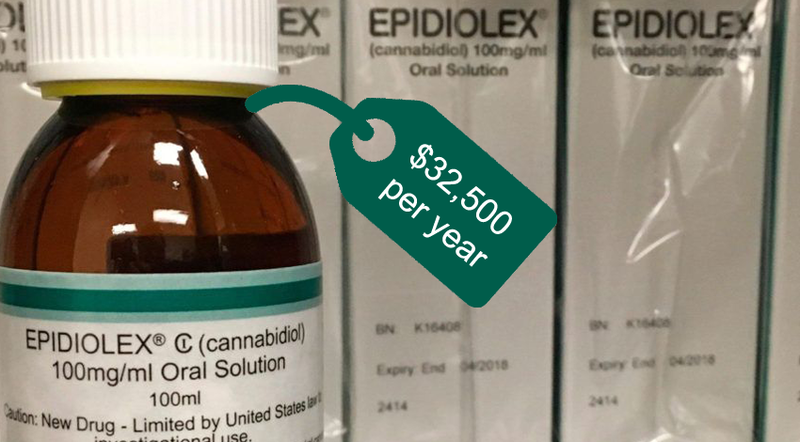 At $32,500 a year, Epidiolex would cost roughly $2,708 a month, $677 a week, and approximately $96 a day. This estimate does not consider age or weight, so it may vary depending on those factors. Although this seems rather high, it’s not as outrageous as one may think when compared to other epilepsy medicines. For example, the epilepsy medicine Fycompa can cost anywhere between $1000 to $1500 a month; and most epilepsy patients take multiple medications. But how does Epidiolex compare to hemp-based CBD extracts? The math gets a little fuzzier from here. Because Epidiolex is not yet on the market, it is also hard to gauge what constitutes a single dose of the drug. However, using publicly available clinical data on the drug, a reasonable estimate can be gleaned. According to a clinical trial published in the U.S. National Library of Medicine, a single dose of Epidiolex contains 50mg of CBD. Now let’s take a look at how it stacks up against one of the leading hemp-based CBD oil brands on the market today, CV Science’s PlusCBD Oil. PlusCBD Oil’s top of the line extract, Gold Formula, costs $160 for a six-gram tube. Each tube contains 85 servings, and a single serving contains 17mg of CBD. To equal one serving of Epidiolex, one would have to take approximately three servings of Gold. Assuming that the patient medicated twice a day, a single tube would last for two weeks. That means a month’s supply of Gold Formula would cost approximately $320, and a year’s worth would cost $3,840. When compared to Epidiolex, the difference in price seems staggering; but is it really? When taking insurance and Medicaid into account, the price difference starts to even out. According to The Wall Street Journal, Medicaid recipients could expect to pay anywhere between $5-$10 for Epidiolex. Patients with insurance could expect to pay upwards of $200 a month, depending on their plan. Competition may also start to eat into the price. Although Epidiolex represents one of the most promising treatments for patients suffering from Dravet Syndrome, a new drug being developed by the pharmaceutical company Zogenix is working its way through the drug approval process. Dubbed ZX008, the fenfluramine-based medication is on track to submit regulatory filings with both the U.S. and the EU, which means the drug could be out to market by 2019 or 2020. More competition would naturally lead to lower prices, as well as a shrinking profit margin for GW Pharmaceuticals. As long as a patient has insurance, be it Medicaid or a private plan, most of Epidiolex’s costs are mitigated. Even for those without insurance, increased competition should help ameliorate the financial burden along with hemp-based alternatives such as PlusCBD Oil. Although Epidiolex may not be the cheapest medication on the market, it is by no means the most expensive. California Department of Public Health Publishes FAQ Trying to Ban Hemp-Derived CBD Oil. But What’s Really Going on in California’s Emerging CBD Market?